Could you speak a little about your background and how you became involved in strength and conditioning? I got my B.A., M.A., and Ph.D. from ASU in exercise physiology and dietetics. I teach at Grand Canyon University, but I also wanted to merge science with performance, which is why I started my company, Lifestyle Solutions. The whole point of the company is to do metabolic assessments to help people achieve their goals. We measure resting metabolism and VO2 max, with the idea being, whatever your goal is, these numbers can help tailor your diet and your exercise program to your specific needs. For example, the resting metabolic rate assessment can help with weight loss. Sixty percent of your energy expenditure comes from that metabolic rate, and instead of guessing it, we can measure it. That’s really useful for athletic performance too. For athletes, it’s important to know if they’re undereating or overeating. The other thing about that assessment is that it’ll tell you if you’re a good fat burner or a good carb burner, which can help in both fat loss programs and customizing athletic programs. What does a resting metabolic rate assessment involve? We want to measure your metabolism at its true resting rate, so you’ll be fasted and rested. If you went to a nutritionist and they wanted to give you your resting metabolism, they’d use a fixed equation, which is really just a shot in the dark. This is much more accurate. When you come to us, you’re rested, fasted, and you’ve avoided caffeine and alcohol. You lie there for thirty minutes. For the first fifteen minutes, we’re not doing anything, just getting your body to rest. Next, we put a mask on you to measure all the oxygen you’re consuming and the carbon dioxide you’re expiring. We use the direct relation between caloric burn and oxygen consumption to measure your resting metabolic rate. With that number, we can better assign the amount of calories that you should eat. The test also gives us your respiratory exchange ratio, which tells you if you’re burning carbs or fats at rest. A normal person burns about 85%-90% fat. For people who burn a lot of carbs at rest, endurance activities would be harder. The human body has a sizable store of fat to burn for activity, but carbs are much more limited. People who burn more carbs at rest would also find it harder to lose fat. What is VO2 max, and what does the VO2 max assessment involve? VO2 max is the maximum amount of oxygen that you can take in and extract. Your muscles need to be able to extract the oxygen in order to put it to work. You can train your pulmonary system, your cardiac system, and your muscles to use that oxygen more efficiently. 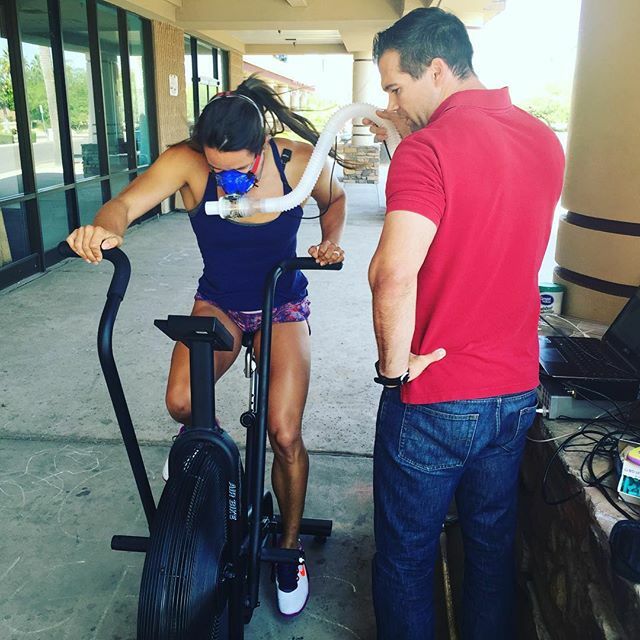 To test VO2 max, we can use a lot of different devices—the bike, treadmill, or rower. A device that incorporates more muscle mass—like a rower—will typically give you a higher value. The number it gives you is your overall max. We get you on this machine and we slowly increase the intensity so that by 15 minutes or so you physically cannot go any harder. That gives us your overall VO2 max, which is a strong predictor of athletics success, particularly for CrossFit. 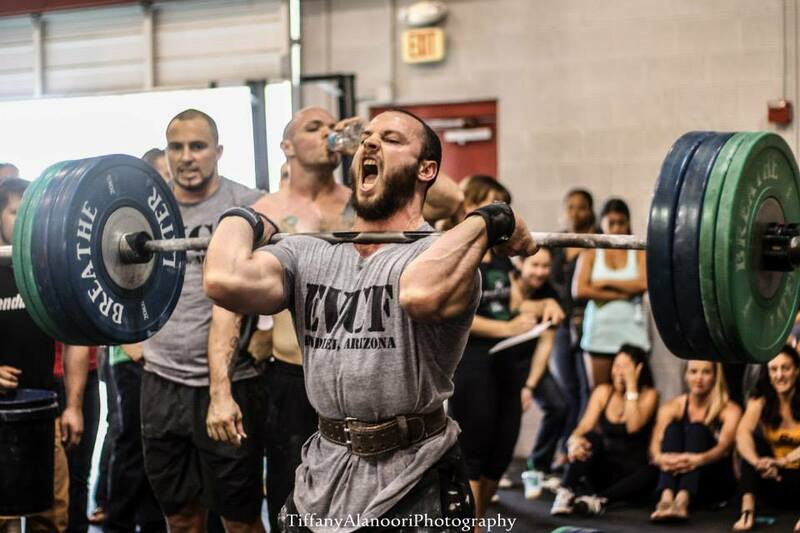 Actually, recent research has shown VO2 max to be a very strong predictor of CrossFit success. The other measurement the test will give us is your ventilatory threshold. Sometimes people use the term “lactate threshold” or “anaerobic threshold,” which each mean slightly different things, but the purpose is similar. As the test progresses, we’re gradually ramping you up, and the ventilation pattern will go up in a nice, steady line. Then there’s a certain point where the intensity gets so high that the pattern leaps up, and your body’s ability to deliver oxygen to its muscles becomes the limiting factor. That’s the threshold. We want to be able to push that threshold higher. There was a study last year that showed that CrossFit workouts required people to be exercising at about 64% of their VO2 max, so we want your threshold to be above that. VO2 max will also give you lots of information in relation to weight loss. You burn more fat when you exercise at a lower intensity and you burn more carbs at a higher intensity. We can give a prescription based on your specific numbers – meaning, we can tell you that you need to be training, for example, at 60% of your VO2 max… to work on your ability to burn fat. So, does that mean there’s actually a “fat burning zone?” I thought that was a myth. What is a myth is that, training in the fat burning zone is the best way to lose weight. The fact is that there is a range where you’re burning the highest percentage of fat. Where that got controversial is that trainers used to tell their clients who wanted to lose fat to train in the “fat burning zone” all the time, which isn’t effective. Training in that zone does help you be a better fat burner both in activity and at rest. But, if your goal is to lose weight and you train in the fat burning zone all the time, that’s not ideal. So once you have your VO2 max and the ventilatory threshold, what do you do with it? Once we know VO2 max and that ventilatory threshold, we can then customize training zones. We give our clients a spreadsheet that gives them training guidelines—for example, we need you training above your ventilatory threshold to get it to shift to the right. Increasing VO2 max is intensity dependent. If you’re not increasing intensity, VO2 max is not going up. Some days, though, we train below threshold—in zones that burn the most amount of fat, which helps you become a better fat burner during exercise. It doesn’t matter how skinny or fat you are, humans have a large reserve of fat during exercise, so we want individuals to be able to use that during exercise. By how much can you feasibly improve your VO2 max? Are some people just going to have lower ceilings than others? Hands down, the biggest factor for VO2 max and resting metabolism is genetics. To put it in perspective, Lance Armstrong boasts about 90 ml/kg/min. 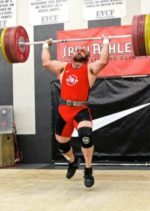 Most (male) CrossFit athletes that I test are usually in the 50s. 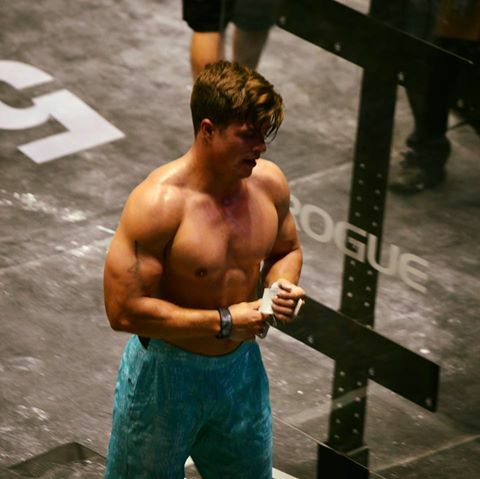 If you want to be successful in CrossFit, you want to shoot for the upper 60s. The literature is a bit mixed, but somewhere around 60% of VO2 max is genetics. They say that athletes are born, and that’s true. That doesn’t mean you can’t improve, though. You still have 40% with which you can improve—that’s a lot when you think about it. I’ve taken people with sub-par VO2 maxes and seen them achieve tremendous gains through a training program.